"The Ambitious Leader in Tumultuous Times 乱世的枭雄 (luàn shì dè xiāo xióng)"
Well, here we go again. The same old face we've been seeing for so many years... gets EXACTLY the same face. If i'm honest, he just isn't as appealing as he once was since he got powered down. The "good" guy. Liu Bei is the founding ruler of the Kingdom of Shu Han 蜀汉 during the Three Kingdoms Era. The impression of Liu Bei amongst people today depends on which side of the fence they are on. If they are fans of Shu Han and its chivalry, they would say Liu Bei was a benevolent leader, well-loved by his people. If they are not fans of Shu Han, they would say he was too soft and too kind. Either way, the fact is that you cannot possibly know Romance of the Three Kingdoms without knowing Liu Bei. Character ability: "Benevolence 仁德 (rén dé) "
During your action phase, you can give any number of on-hand cards to any other player. If you give three or more on-hand cards away in a single phase, you regain 1 unit of health. "Benevolence" is weakened. 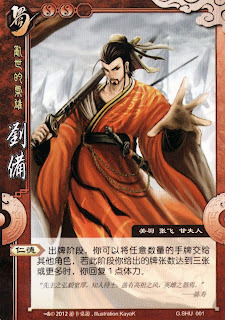 You can only regain health by giving three or more on-hand cards in a single phase, instead of two in Normal SanGuoSha. His ruler ability is also removed. Liu Bei is regarded as the benevolent leader in Romance of the Three Kingdoms, usually generous and kind to his followers. The ability to give cards to any player mirrors Liu Bei's generosity. Three or more?! Has the rule for this character been changed? In the online game you play at the "offical" website he gain 1hp each time he is giving out 2 cards. And he can continue to do that for as many time he has 2 cards to give out. This change affects Liu Bei for Kingdom Wars only. It has been re-balanced! Still the description in the page with the old rule is still wrong. Liu Bei can use his ability as much as he want and gain life from it. Liu Bei's picture had been changed slightly. The background is whiter than the original, and there's a flag in the upper-right corner.